How to Make a Wug! Want a wug for your desk? I've made these myself with a 3D printer, and now you can make two for yourself too. I'm sharing the model and instructions for free! Warning: these wugs are cute but they are not toys, because they have small parts that might be dangerous for children or even pets! By using the 3D model I provide below you agree to take responsibility for your own prints, at your own risk. I am not responsible for how you use the wugs. They should be perfectly safe if you're careful with them but I don't want anyone to get hurt if not, and don't want to get in legal trouble if someone does. As I said, at your own risk, but it should be fine with a normal level of precaution. I would suggest the full resolution model, but depending on the quality if your 3D printer, the low resolution model might be enough and it might be easier to run on a slower computer or if some websites for ordering 3D prints have filesize limits below 15MB. Note that you can view that file (it's in STL format, standard for 3D printing) with different software programs that can view 3D files (Blender is free, for example), and it should be compatible with most 3D printers. If not, you can convert it to OBJ or another format with free software you can find online. Remember: you probably want two wugs! --Legs: make these out of wire (or even a paperclip). It's best for attachment and stability if the legs are made from one piece of wire. Follow the steps below. If this sounds too complicated or hard, you could of course do something else like make legs another way and glue them to the body of your wug. It can be a bit difficult and require some strong pressure from your hands, so ask for help if you need it. I recommend using wire cutters to cut, shape and push the wire through the model. Doing it with your hands alone would be very difficult or even dangerous. Step 1: Cut the wire about twice as long as you'll need for the legs (maybe 6 inches). Or unbend the paperclip. Step 2: Using wirecutters, clip at a sharp diagonal angle near the end of the piece of wire. You're making a sharp point to use to puncture through the 3D model. Be careful! Step 3: This is the hard and potentially dangerous part. Be careful! As above, do this at your own risk, using the proper tools and safety precautions. Force that pointed end (like a knife) through the side of the wug model. I suggest holding the wire with wirecutters to do this! And then force it through the far side. Once you see it poke through, grab it from that side and continue pulling until you have enough to work with for the legs on both sides. Do not pull so far that it goes all the way through and comes out all the way, or you'll have to start over. With some materials this will be very difficult or impossible, so you may need to use a drill to make the hole. It is best to not a fully filled, solid model so that it is easier to get the wire through. For the relatively soft material that I use (see below), I use a thumb tack to poke holes on each side, then use wirecutters to hold and force the pointed end of the wire through, and that works well now that I have practiced a few times. It might be difficult the first time, but it's possible. If you cannot push a thumb tack into the model, you will not be able to force the wire through. That means you need a drill. Step 4: Once the wire is sticking out both ends with enough left over to make the legs and feet, you should clip off the sharp pointed end of the wire you used to push it through. Then use wirecutters/pliers to bend the ends of the legs into feet (the front end of the wug's base should be held up in the air a little bit, like in the pictures). It's easiest to do this if you leave some extra length on the wire before bending. I've just made circles, but you can be more creative if you want. Clip the wire off at the right length, and use your tools to tighten the circle. If you want to avoid the sharp ends of the wire you might apply some superglue to the end of the wire to the other side of the circle to hold them together. Bend the feet up a little bit so they rest flat, at about a 90 degree angle to the legs. If you used a single piece of wire for both feet you should be able to adjust them a little bit as needed. I can't comment on other printers, but I'm using a Micro3D printer, and I'll tell you about my settings/preferences here so you can try to apply them to your 3D printer or when you order a print online. 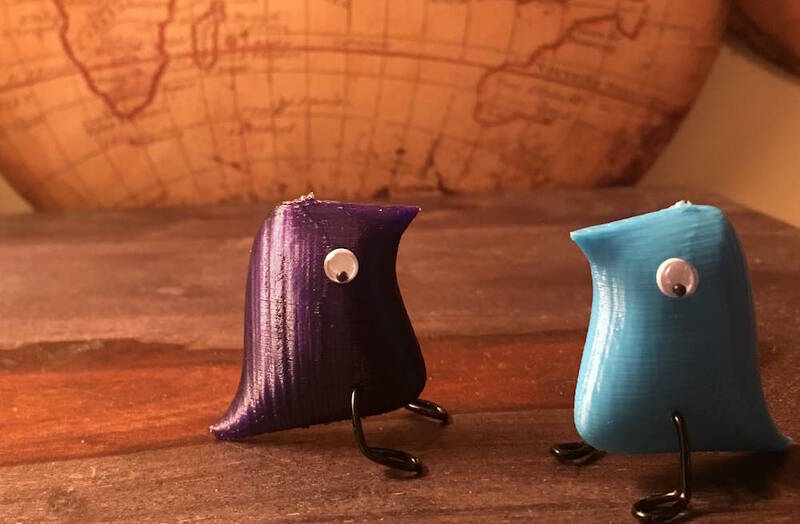 --I have printed my wugs in blue and purple. Note that for a real wug test you might want two of the same color. Print any color you want, or even paint them afterwards. Note that 3D printers do not print 'in color' and just make a shape in one color, so you will need to use 3D ink (it's just plastic filament) that is the color you want, unless you plan to paint it later. If you are ordering online, make sure they have the color you want! --As for print settings, I've used about 150mm resolution, which seems fine, and I've printed hollow with a little fill to hold the shape (again, the Tough Ink is a little stretchy, so this is nice). You should turn on "support material" (and a 'raft' base) because the bottom of this model is not flat so you will need some way for it to stay in place while printing. You should be able to easily remove this after it is done. --For size, I have printed this model at about 4x, which is around 1.5inches (or 4cm). Print whatever size you want (although make sure it's not too big for your printer or too small to print accurately, and that you can find eyes that fit well.) For some online printing services you might need to adjust the size of the model so that it prints well without adjusting the size online if they don't offer that setting. --Be aware printing this model at the settings described above takes about 2.5 hours. Printing it larger might take a very long time (maybe a day if you print it 12 inches tall). And larger sizes might be very expensive to order online. The cheapest 3D printers to purchase are several hundred dollars, so that won't be worth it unless you plan to use it for more than just a few wugs. But if you do, buying the 3D filament ink means that each wug would cost about $1 to print yourself (at small sizes), so in that sense it would be less expensive. I would ask that you do not sell these to others, but you can share them with your friends, and you are of course welcome to link them here. Please reply here if you have questions about how to print, although I can't promise to be able to troubleshoot everything for you. If you have any suggestions for print settings, online services, or anything else, please reply with your experiences too. 3D printing is a new technology but has become accessible recently and will become easier and more accessible over time. It can be a little confusing at first, but I hope offering these 3D wug models to print is fun rather than frustrating-- Questions are welcome and I will try to help! You could also make your own version of a wug 3D model if you want (you could try to include legs and/or eyes, but those might not print very well, and not in different colors), or you could try making them another way, like out of bakable clay for crafts. But the 3D model prints well and I'm happy with how it turns out, so I hope it's helpful for some of you! Don't want to 3D print it yourself? I won't be able to make these for everyone, and I am not going to sell them, but during the month of February, 2017, I will be giving some away to members of the forum! So remember to sign up for that.